Originally from rural Argyll in Scotland, Susan graduated from the University of Aberdeen BSc (Hons) in Zoology in 2006 before continuing her studies at Glasgow University Veterinary School, where she graduated in 2013. During her University vacations she visited Africa several times, studying toothy predators from lions to Great White sharks. 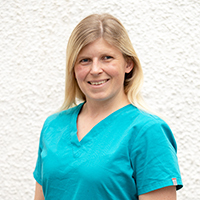 After some time in mixed general practice, Susan joined DentalVets in 2015 as a full time resident in the American Veterinary Dental College programme working towards board certification and specialist status. She is a key member of our clinical staff and training team. Her hobbies range from competitive sailing in the summer to skiing in the winter. She recently took on the challenge of a Vizsla pup.